Making sure your cat gets enough water in their diet is crucial. Cats are naturally drawn to moving water because in the wild that's a good indication of freshness. Pet fountains are the perfect solution for your cat's health and we believe every cat family should have one. 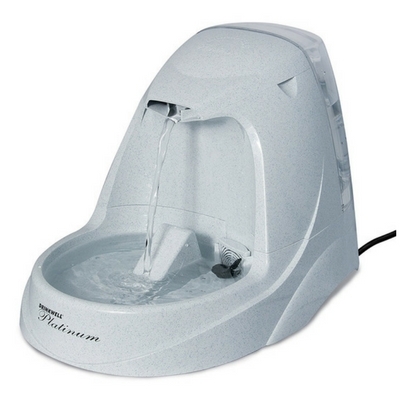 We've gone through countless pet fountains over the years and we've had love-hate relationships with a number of them. Even our top-rated fountains have their shortcomings, but we'll guide you through all the pros and cons and help you decide which pet fountain is right for your home. 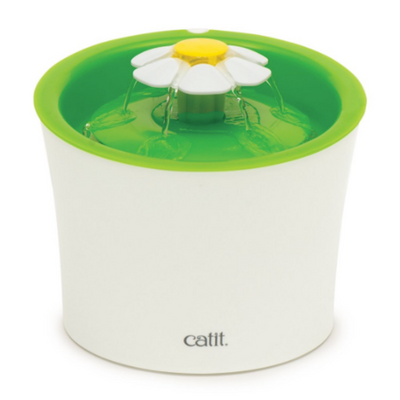 The Catit Flower Fountain holds its position as our top-rated cat fountain for another year. This stylish flower fountain is functional, quiet, and has excellent capacity. But the thing that really sets it above the competition is that it is super easy to clean. 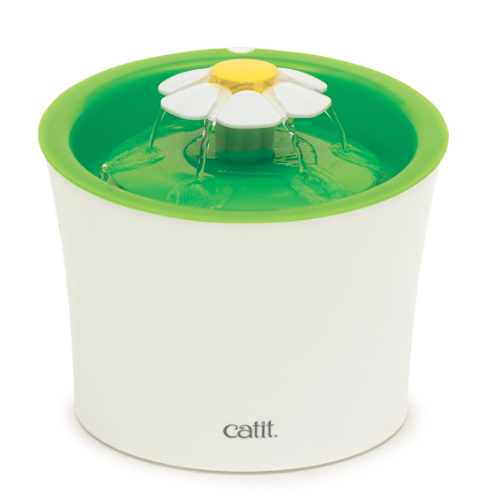 The Catit Flower Fountain has minimal parts and pieces. It is simple and that's the way all fountains should be. The PetSafe Drinkwell Seascape Pet Fountain is a beautifully designed cat fountain that is attractive enough to be placed anywhere in your home. This fountain is virtually silent. There is no humming noise and no trickling water sounds coming from this fountain. It didn't take our cats long at all to make the switch from their Drinkwell Platinum Fountain to this fountain. This ceramic fountain is more hygienic than plastic fountains and it's also pretty easy to clean. The Cat Mate Pet Fountain is a simple fountain that provides multiple levels for your cat to drink from. 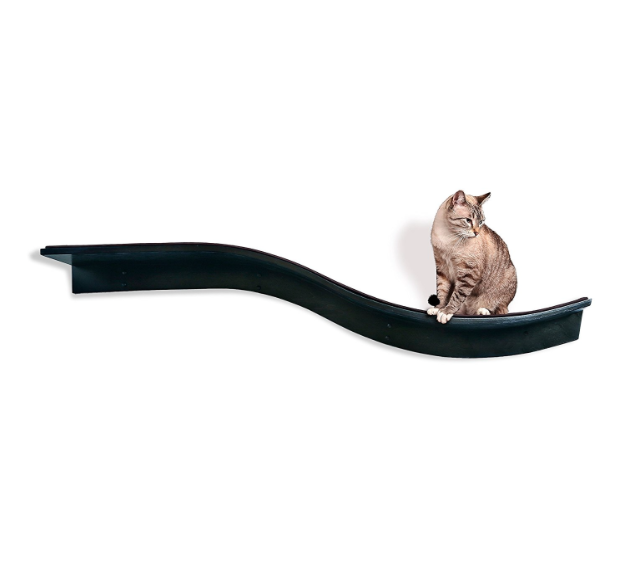 We like it when manufacturers keep their products simple and Cat Mate has succeeded at that with this fountain. 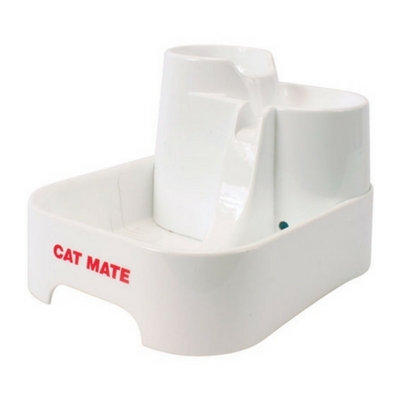 The Cat Mate Pet Fountain has minimal parts and is pretty painless to clean. The only real negative is that this fountain has a very low capacity and will require frequent refilling. 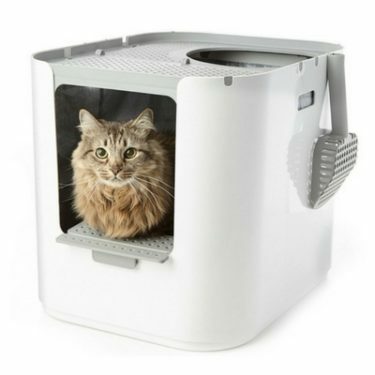 The PetSafe Drinkwell Platinum Pet Fountain is arguably the most cat-friendly pet fountain on the market. This fountain was designed with your cat's interests in mind. 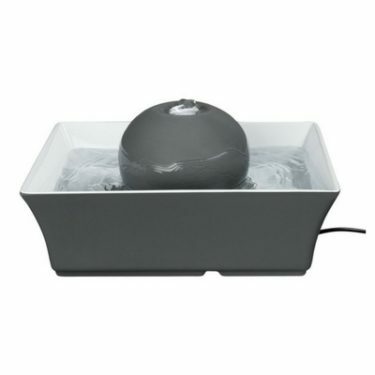 The free-falling water stream and extra large bowl are very popular with cats. We just wish more attention was given to making this fountain more owner-friendly! The Drinkwell Platinum Pet Fountain is a huge pain to clean because of its many small crevices. 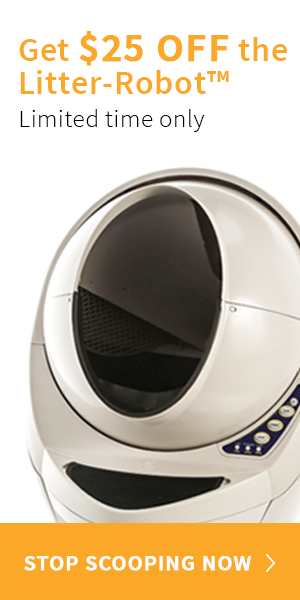 The PetSafe Drinkwell 360 Pet Fountain is an excellent large-capacity fountain for multi-pet households. You can customize this fountain's flow settings by adding or removing rings. The Drinkwell 360 Fountain is easier to clean than the Platinum, but it is still a bit of a chore due to the multitude of pieces. 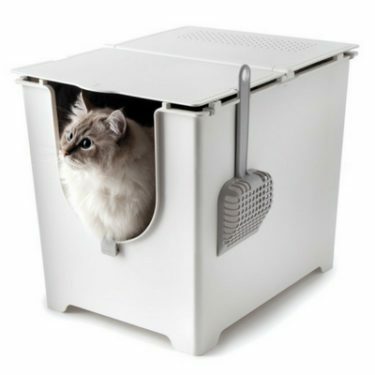 The PetSafe Drinkwell Multi-Tier Pet Fountain is a good size fountain for single cat homes and for families with multiple pets. The fountain has 2 levels for your cat to drink from along with a free-falling stream. Thanks to the small plastic ramp the free-falling water stream doesn't make any loud splashing noises. 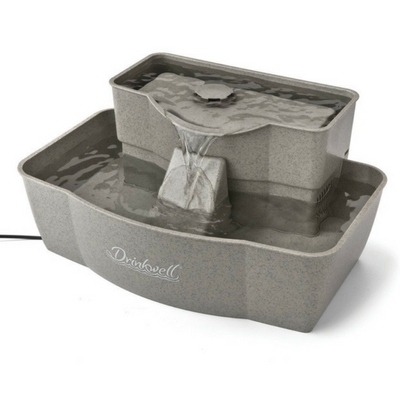 The Drinkwell Multi-Tier Fountain has only 2 main components. There are several small crevices that make cleaning this fountain somewhat difficult. 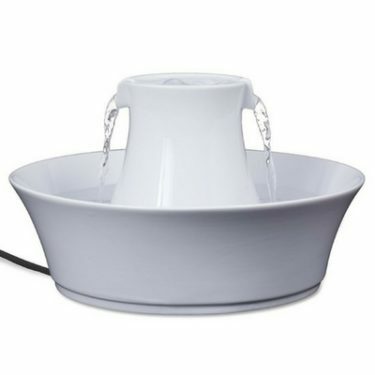 The PetSafe Drinkwell Avalon Pet Fountain is a sleek looking ceramic fountain that most cats will love. The free-falling water streams tend to be very popular amongst cats. This fountain is attractive enough to be placed right out in the open but if you're not a fan of the trickling water noise, you should pick a different fountain. The sound of splashing water is quite loud with this particular fountain. 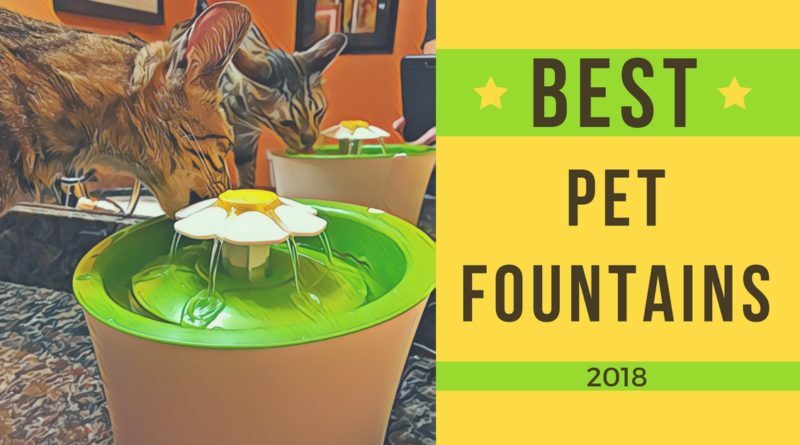 The PetSafe Drinkwell Pagoda Pet Fountain is a zen-inspired cat fountain that doesn't look like a pet fountain. 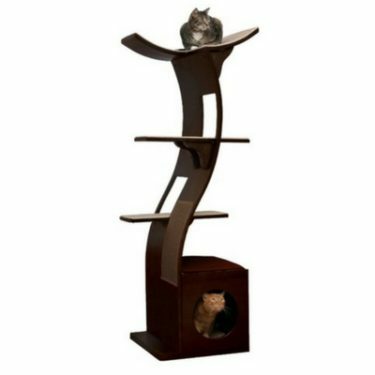 With the same basic design as the Drinkwell Avalon Fountain, the Pagoda gets approval from cats and mixed reviews from owners. Owner satisfaction pretty much comes down to whether or not you like the sound of splashing water. 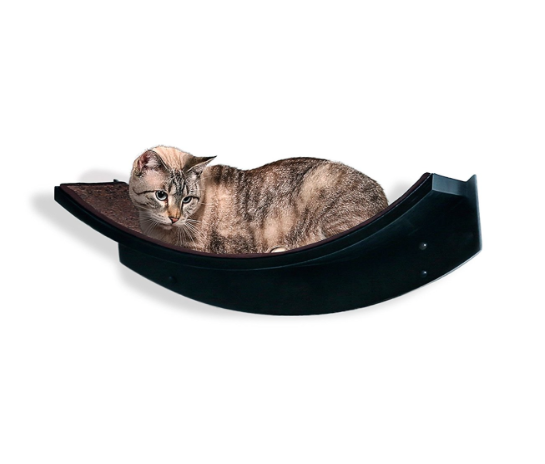 The PetSafe Drinkwell Zen Pet Fountain is a large capacity fountain with some cat-friendly design features like a spacious bowl and extra wide ramp to drink from. This fountain is made of both stainless steel and plastic and it is easier to clean than most. A number of owners have found that the pump gets clogged easily and burns out prematurely. Fortunately, replacement pumps are available. The Pioneer Pet Raindrop Stainless Steel Pet Fountain is a beautiful fountain with a simple, easy-to-clean design. Water cascades around this fountain without splashing or making any noise. The capacity is pretty low so you'll have to refill this fountain frequently. The shape makes it easy to pick up. The top piece of this fountain just rests on top of the base and can get knocked off pretty easily and cause a big mess. Here's a table that compares the fountain dimensions, capacities, and filter requirements. For a more detailed comparison click here. 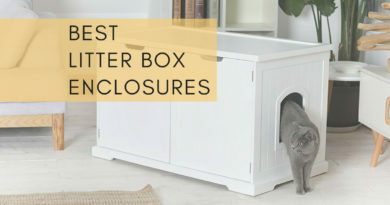 Now that you've seen our top picks we can talk you through some general considerations to help you pick which pet fountain is right for you and your cat. We'll start with selecting the best fountain material, then go over some of the common questions concerning cost and maintenance. 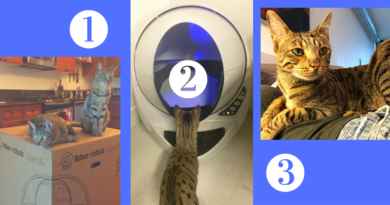 There are 3 main types of cat fountains on the market. Each fountain material has a few pros and cons that you should be aware of before you make a purchase. The most common pet fountain material is plastic. 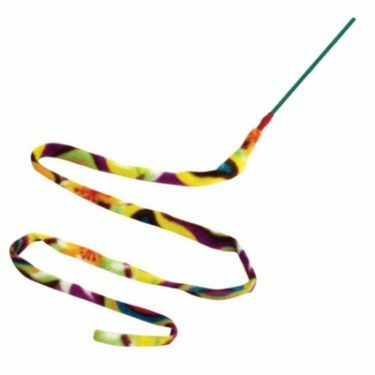 Plastic is inexpensive, comes in a variety of colors and designs, and in most cases is dishwasher-safe on the top shelf. It is a good idea to make sure the plastic fountain is BPA-free. The main disadvantages to plastic pet fountains is that they don't last as long and they aren't quite as sanitary as other materials. Plastic has been known to cause feline acne. If your cat is prone to feline acne, we definitely recommend avoiding plastic pet fountains. Over time plastic fountains develop small scratches that end up being breeding grounds for bacteria. Once this happens, you'll probably need to start shopping for a new pet fountain. 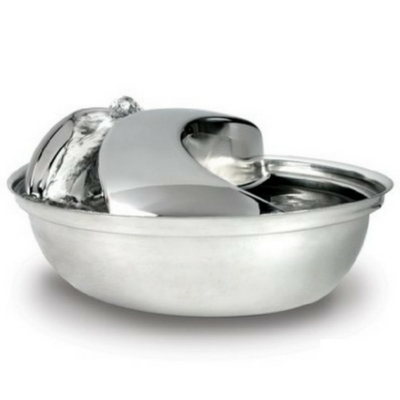 Stainless Steel pet fountains are attractive and more hygienic than plastic. They are also dishwasher safe and tend to be easier to clean. 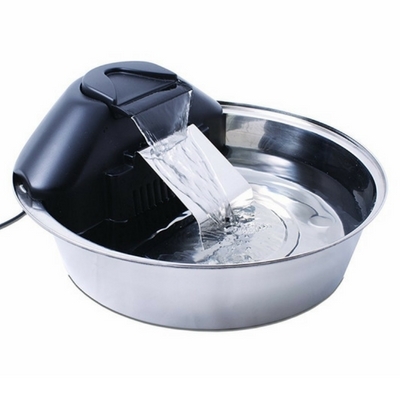 A lot of stainless steel pet fountains still have some plastic components. The pump housing is almost always plastic. And sometimes the filter housing is made of plastic as well. 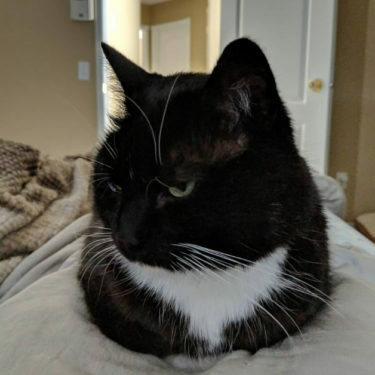 If your cat has feline acne, a stainless steel fountain with minimal plastic components will still be better than an all plastic pet fountain. Stainless Steel is pricier than plastic, but it is also longer-lasting. Some cats are finicky about drinking or eating from stainless steel because of it's shiny, reflective surface. But most cats won't have any issues drinking from a stainless steel pet fountain. 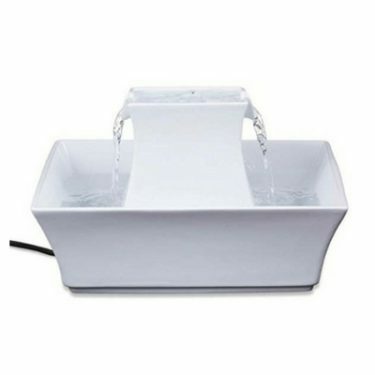 Ceramic pet fountains are becoming more and more popular. Ceramic fountains are the nicest looking in our opinion. They also happen to be the most expensive. Ceramic fountains come in a variety of colors and modern designs that'll blend in with your home decor. They are dishwasher safe and easy to clean. They are also very long-lasting as long as you're careful about not chipping them or breaking them. 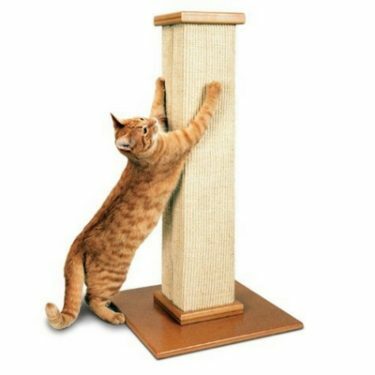 Ceramic is a non-porous material that is very hygienic and excellent for cats with feline acne. Whether you spend several minutes a day turning on the water faucet for your cat to drink from, or you're refilling their water bowl every day, making sure your cat has adequate fresh water is a time-consuming task for pet owners. 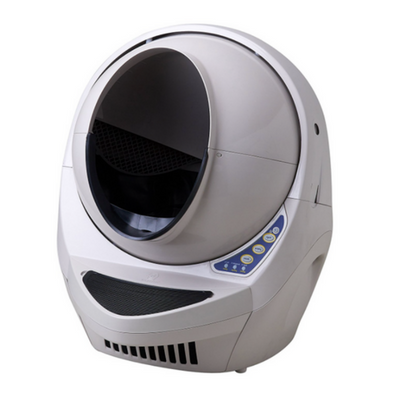 When you have an electric pet fountain, you'll be reducing the amount of daily effort, but you'll have to spend a bigger chunk of time every week or so cleaning your cat's fountain. If you're under the impression that getting a pet fountain will save you lots of time and effort, I'm sorry to be the bearer of bad news, but that simply is not the case. Pet fountains are excellent because they ensure your cat has regular access to fresh drinking water. 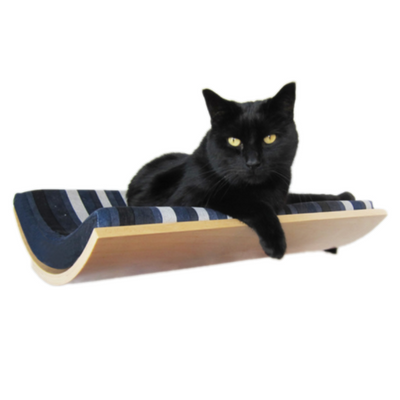 Cats are more likely to drink from a flowing water source than from stagnant water in a bowl. But maintaining a pet fountain will be just as time-consuming as refilling that bowl of water every day. 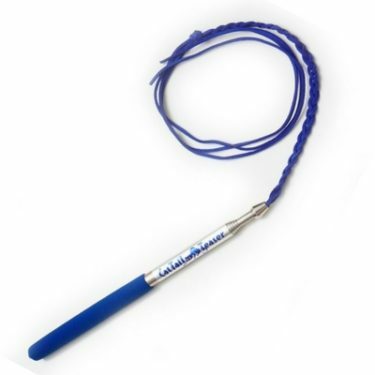 For the deep cleaning we recommend using this brush set from PetSafe along with soap and water. 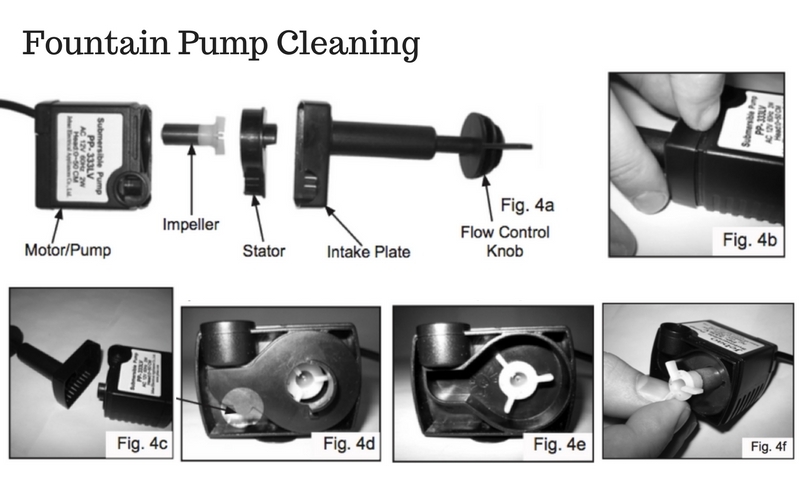 To clean the pump, you'll need to fully disassemble it to clean out all the gunk and debris. These pumps are made of several parts and you really need to take them all the way apart to get them clean. Here's a graphic that shows how they come apart. Aside from the upfront cost of your pet fountain, there are a few other costs you should be aware of before making your purchase. The most expensive cost will be the filters. The power cost is very minimal comparatively. 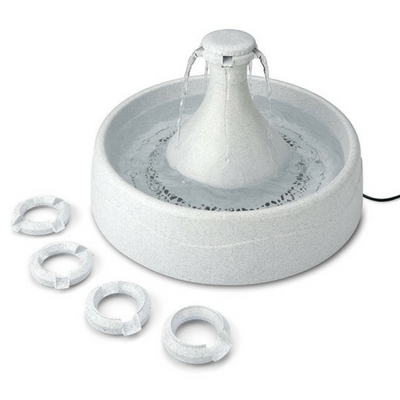 Your typical pet fountain uses a 12V submersible pump that pumps 50-80 gallons per hour and consumes less than 3 Watts. 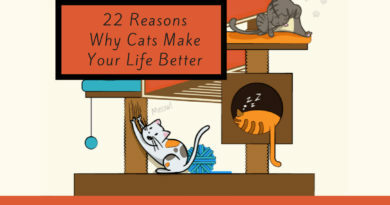 With electricity costing about $0.12/kWh, running your cat fountain 24 hours a day will cost you about $3.15 a year. That shouldn't break the bank! Filters aren't required for pet fountain operation but they are highly recommended to maintain the freshness of the drinking water. They'll also extend the life of your pump. Filters cost between $1 and $3 each and will usually need to be changed monthly. Some fountains are designed with a single filter while others require 2 separate filters - a carbon filter for improving taste and a solids filter for removing debris. The annual cost of filters ranges from $12 up to $50. In a lot of cases, filters will end up costing more than your fountain after a single year.